The source said Pavlensky set fire to the door in the early hours of Nov. 9, after which he and his two companions were detained. The two detainees were later found to be journalists and were released. The source specified that the door to the first entrance to the Federal Security Service building was set on fire at around 3:00 a.m. Pavlensky was detained by officials from the commandant's service and was handed over to police officers in the Meshchansky police office. Investigators have visited the site. Olga Chavdar, a lawyer for Pavlensky, has confirmed his detention to Interfax. "I am currently heading to visit him, he is still in the police station," Chavdar said. 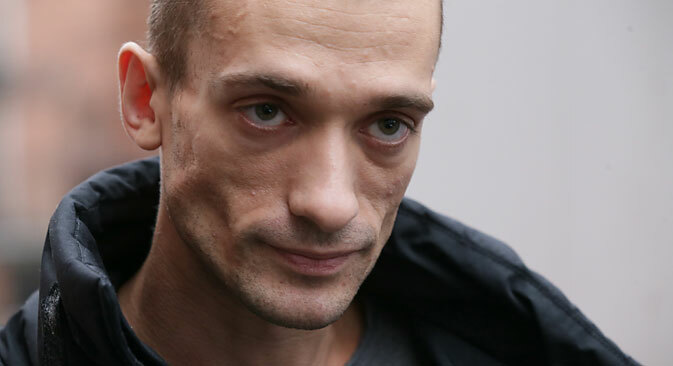 She said she currently has no specific information on the charges that may be brought against Pavlensky, but assumed that he may be charged with arson.